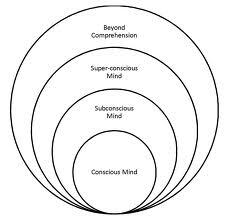 Based on Austrian Psychologist Sigmund Freud’s view, our consciousness can be seen as having three states: id/ego/superego, or unconscious/conscious/superconscious, or lower/middle/upper selves. The unconscious state is our hidden self, our shadow/dark side. It is our inner child and all our stored emotions and feelings. This is the realm of dreams, instincts, and memories. The unconscious can be further divided into personal unconscious (our subconscious) and collective unconscious, or the collective memories and symbols of a culture. The conscious state is our everyday waking state where logic and mental objectivity exists. This is where we use our mental abilities: thinking, analyzing, learning. The superconscious state is our higher/spirit self, our light side. This is where we can access our potential, creativity, and intuition. The abilities that enable us to be the best we can be.